You guys, I am still so proud of myself for keeping up with reading regular while still being out of my mind busy. Let me just tell you everything I had due this month: two one-page lab reflections, a four-page case conceptualization (applying counseling theory to a film character), a ten-page reflection analysis (applying student development theory to my own undergraduate career), a presentation and activity on implementation of an initiative our campus could benefit from and an accompanying five-page paper, a transcription and analysis of a counseling session, two discussion posts and responses, a presentation applying theory to a film character, and two 35-question quizzes. Whew! And I still managed to read all the books below. Dear Mr. M by Herman Koch: see review here. The Kept Woman by Karin Slaughter: see review here. Everything, Everything by Nicola Yoon: This book was a quick and easy read that reminded me of a YA version of Me Before You. It follows teenage Maddie, a girl with an immune-deficiency disease that won't allow her to leave her home. I was able to read it in a day, because it's fairly short and includes some fun artwork. I didn't hate the book, but it's not really one I was recommend either. Behind Closed Doors by B.A. Paris: see review here. A World Without You by Beth Revis: I definitely recommend this book, which is absolutely heart-wrenching. It deals with some hard topics in mental illness and will you have you sobbing. This story follows Bo, a teenage boy who believes he can travel through time and must do so in order to save his girlfriend, Sofia. Make sure to grab a box (or two) of tissues before delving into this novel. I Let You Go by Clare Mackintosh: I enjoyed this book, which follows a woman who is distraught after the loss of a child. Don't be fooled, though, because this is definitely a thriller. Near the end of the book, I had to go back and re-read several chapters because there was a pretty amazing twist. Sweetbitter by Stephanie Danler: Meh. I wasn't a fan of this book. I'd heard several great things about it, but truly nothing really stood out to me about it. Granted, I've never worked in the restaurant world, or even been to New York, but apparently this book is terrific if you've lived in New York or worked in a restaurant. If you've read this book and either of those things apply to you, let me know if you were more intrigued by this book than I was. As I'm sure you gathered from the last couple of sentences, this novel is about a 20-something that moves to NYC and starts work in a high-end restaurant. It's a coming of age novel that takes place over a full year (the novel's divided up into all four seasons). I didn't like the main character, and I felt like there was a lot of opportunity for further character development for several of the characters. It was too fast-paced, but not in a good way. I felt like I was missing something. Also, I hated the ending. 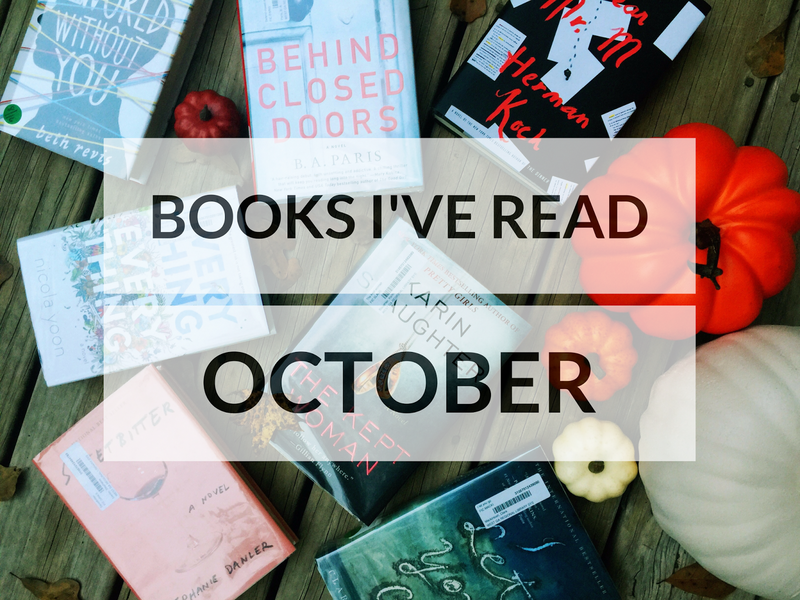 What do you read in October and what's on your TBR list? I read Eats, Shoots & Leaves (great for grammar geeks like me! ), The Hours (I am trying to read all of the Pulitzer Prize winners for fiction), The Fall Guy (my Book of the Month selection), Grind (an author sent me this one to review), and Norm MacDonald's "Memoir." I would highly recommend the first two on this list. Happy reading!